The last Swing glider i flew with the RAST system was the Arcus RS, and here’s the new high-end B from the same manufacturer, the Nyos RS in size S (75-95) flown at 93.5 all up with an X-rated 6 harness. The Nyos RS construction holds a normal nose. The lower lines are sheathed with the higher ones unsheathed. The lines are slightly thicker than the competitors in the B category. Launching is quite easy in nil wind, and even in strong breeze. The Nyos inflates quite smoothly and evenly. 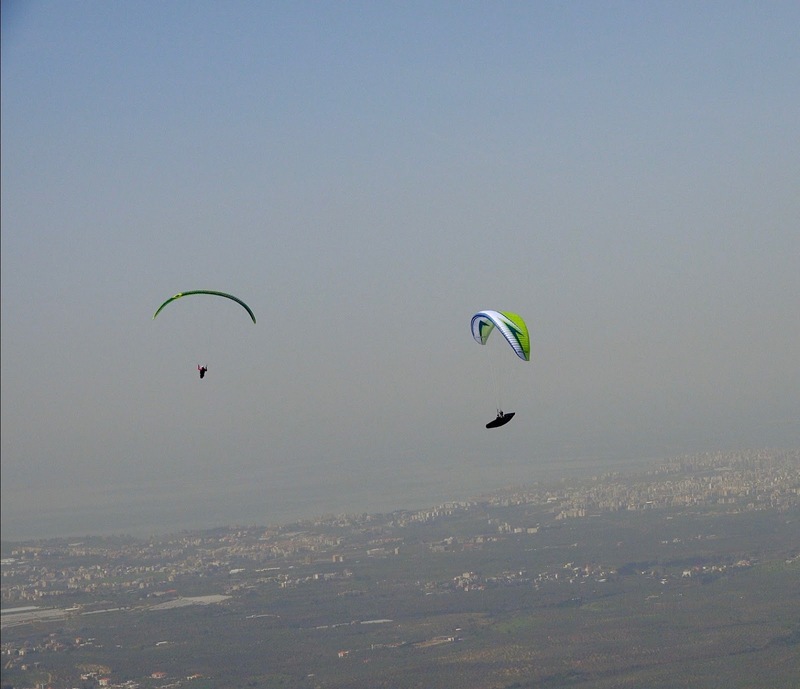 First turn, i could feel the moderate to short response on the brakes, with quite a nice agility in thermals ! The Nyos RS turns quite flat with moderate pressure on the brakes and could be described as quite agile! It doesn’t handle like an acro wing for sure and it’s not suppose to, but for a handling seeker like me, it’s very satisfying ! Thermals can be cored very tight, even the turbulent ones. The handling alone doesn’t really matter sometimes if the glider above the pilot is jumping around all the time. Underneath the Nyos RS, the movements in turbulent air can be described as “computerized self controlled” , as the Nyos RS feels very compact and super smooth to fly ! I flew this glider in some turbulent air, and got myself into a sunny lee side of a cliff, when the wind was blowing around 20 km/h from the other side. Usually the experience is not really joyful…but it was quite soft on the Nyos RS ! I got a bullet thermal that got me into higher layer, and kept my flight going on further. I have been flying this path for a very long time, and underneath plenty of gliders. The Nyos RS was the coolest, most reassuring, comfortable glider ever to be flown among B’s ! The experience flying the Nyos RS is exceptional when it comes to comfort ! Even compared to some low B’s ! Having said that, the Nyos RS could not be considered as a dull glider at all. It will inform the pilot about all the movement of the air around, but with such rare serenity and homogeneity and an efficient leading edge that surfs the airmass moving constantly forward in a super smooth way ! Incredible ! All that, led me to say, that the Nyos RS is indeed “The Rolls Royce of the sky” ! Even in turbulent air, there not pitch back ! The Nyos RS just simply move forward quietly with that amazing solidity and super cohesive structure ! Some B gliders will have sharp movements, or a bit of yaw, some pitch…But not the Nyos RS. It just inform the pilot and filters wisely only the excess of turbulence ! 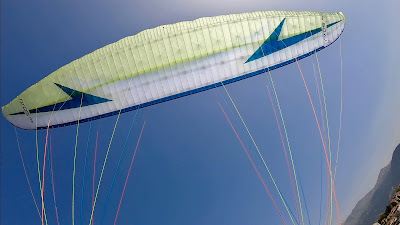 Gliding with top high B gliders in moving air, i could notice that the Nyos RS is very competitive, and i could put the gliding efficiency among today’s top four, high-end B gliders. The interesting part of the glide in turbulent shaky air, was the easiness of the C risers control. Using the bar in total confidence with the C riser control will deliver a quite efficient glide and they are super easy to use with moderate and progressive pressure. If only a thinner line version would be feasible, it could perhaps squeeze up even more overall performance to dominate the category. Climbing in weak and strong could place also the Nyos RS among the top 5 gliders in the high B category. Ears are stable, efficient, and reopen without pilot input. The pluses: The ratio of usability ! I mean exceptional comfort and homogeneity with smooth information coming through! Conclusion: The Nyos has a normal nose, normal width lines, yet it glides beautifully and efficiently into wind. As for the flight characteristics and compact structure, I can totally confirm that the Nyos RS has somehow a different feel from many B’s i have tested. It has a very taught, super homogenous structure, with precise and direct brake response. 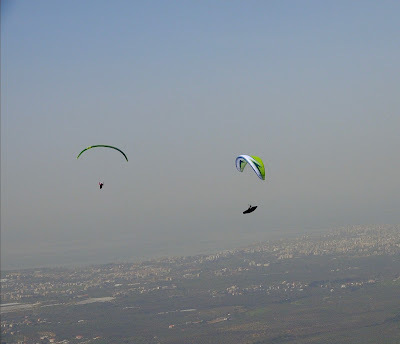 The comfort flying the Nyos RS is very high. Pilots flying in strong air and alpine conditions wishing for a solid, well mannered companion, should strongly consider flying the Nyos RS as a good option. I’m not an engineer to talk about RAST and the benefits that comes along…but it seems what i have experienced flying the Nyos RS couldn’t be understood otherwise. How would you compare solidity-in-turbulent-air and pitch behaviour to ION4? I'm flying ION4, but missing some feedback. Thank you. The Nyos RS is very solid in turbulence and also more informative than the Ion4. For a B pilot, the pitch on the Nyos RS is = very manageable. It resembles the IOn 4 one. So usefull your reports. Thank a lot. The leaf you described as very comfortable, I fly on a leaf and I am looking for the next wing. could you compare them? Your descriptions are very helpful and unique. They are very similar in comfort. Oh my i just flew leaf and was sooo happy with comfort that i broke my personal best in montain flights, in quite turbulent conditions. If nyos is that comfy ! Awsome ! During flight i wished sometimes i had more speed or penetration. I really need to try that nyos ! Hi Ziad, your reviews are one of the best and most informative. Thanks a lot for all your effort. I'm finding Nyos RS very interesting glider and was wondering about your thoughts on comparison between Chilli 4, Explorer, and Nyos RS. Are they all in the same ball park when it comes to performance? I can only see Nyos, but not Nyos RS... Or am I missing something? Hello Ziad. When I look and compare with the Cumeo in the B chart, it seems the Nyos is not a good climber in weak conditions. Which makes me hesitate to select this glider. Does this criteria impact the overall efficiency and could you see a real difference compared with other gliders in those conditions ?? The climb of the Nyos RS is good in overall conditions. There will be always gliders that floats in weak slightly better...you can't have it all in one glider...but that doesn't have to alter your choice.